Well, I skimmed (which I usually don't do, I READ and REVISE) most of my scenes last night and got pretty discouraged. I suppose I shouldn't say this in public. ;) Anyway, they are a mess. 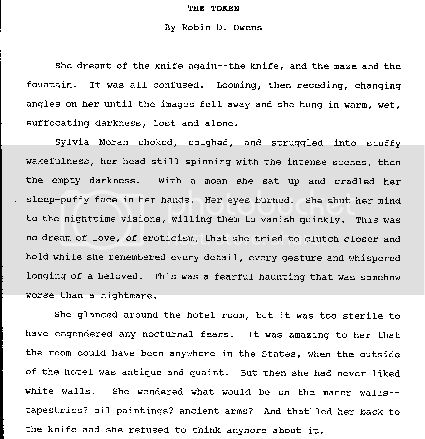 One lovely scene in the heroine's teahouse can be cannibalized a bit for an earlier chapter, but the rest can truly be summarized "the venture was a success." That's telling, but we don't need a full scene for this. We already know she plans and works hard to be a success. Some scenes you DO need a full scene to set up a punchline, but not many of the ones I've written. Most of them are about Celta, how things work. Again, they may go in the READS file on my website after the book is published, but right now they go in the Holds file. In the Artist's Way on the section on criticism, Julia Cameron states that sometimes your work goes through an ugly duckling phase. I feel that's true here of Heart Search. And that ugly duckling phase is necessary for the work/the artist to grow. Praying for that. I've always considered my Heart series books, romances, that most of the plot is focused on the relationship between the hero and heroine. And that relationship sometimes grows slowly, too slowly I think for some romance readers. There's a lot of worldbuilding -- and time spent with characters, and Fams -- in my books. Mentor and critique groups told me that they like chapters 1-4 of Heart Search, but the reality is, it's mostly about the characters, Celta and the Fams. Heart Search is bothering me this way, so I am working on my romance technique. This mostly involves cutting full scenes, maybe even chapters where the hero and heroine aren't together. Some of these I'll put up under the READS section of my website after the book is published. And (after a time out), I looked at a scene between Camellia and her two friends and Fam and cut it. I needed ONE LINE from that scene to make a point and stuck it back into Chapter 4. May you know what you need to do today. Here is the cover of Heart Search, for your comments. May you be pleased with your work today. And the article:. All this for one line: Anger throbbed through his left temple....and you know I've seen anger throbbing at temples before... So it's not exactly new, heh? May you enjoy where the internet takes you today. p.s. 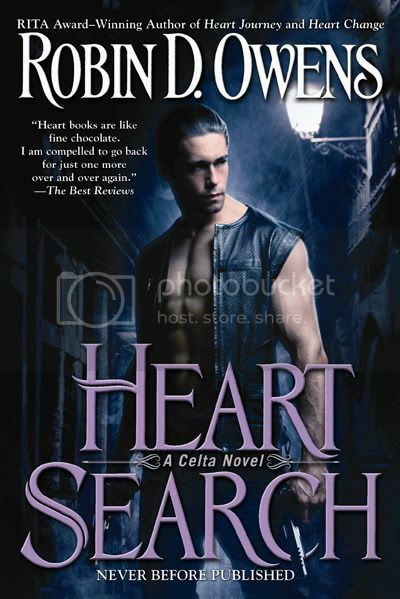 to see if you're paying attention, I got the cover of Heart Search today, but didn't put it up yet since I'm still fumbling with my graphics program, and I'll have to shrink all the pics above again. I ran the memorial table for RMFW this year (actually I do it every year since the first about 3 years ago, but we actually lost people this year), and I usually pick up books by those authors whom we lost. I decided to take a look at a couple of the romances, and couldn't get more than a few pages in. I just KNEW that the first book was based on A Big Misunderstanding and Miscommunication. Readers are savvier now -- and so are people. I HOPE folks know enough to talk stuff out. Habits, society, mores have changed. Nor would romance readers put up with an FBI hero telling the heroine her laughter was like silver bells. This might have been the original that the cliche came from, but we all know that no alpha guy would say that. Maybe "you have a nice smile." I'm also reading Mulengro by Charles de Lint, not very far into it, and it's Romany in the 80s in Canada, and I can't help but believe that their society must have changed greatly. I may be wrong, but it just seems quite old, more like a 60s book. And the technology has changed extremely. In any event, I recall that I didn't LOVE the book at the time, but am giving it another chance to stay on the shelves. Not ready to report on RMFW conference yet, though my seminar went well, and the On The Spot Plot was hilarious (I have my notes on what we wrote on). May pleasure stud your days. I am doing the best I can with the resources I have. Or, if you're looking at something you've done: I did the best I could with the resources I had at the time. I've been working on my Survive to Write, Write to Survive, how to hang in there until you're published workshop and have it down. No notecards any more. I have gone tech with my itouch. It's about the same as a notecard anyway. I've also been doing a 5 minute speechlet on the Middle Of The Book, for a panel I am on. It's now at about 4.50 seconds which should be ok.
We'll see if I can (once more) pull these off. We don't anticipate the panel to have many people (maybe more on the panel than in the audience) because we are Sat am at 8 and opposite the agent panel. Anyway, that's why I've been mum. Also, I've been reading Save The Cat, which is a wonderful plotting book. I am so thrilled and stunned! Mentioned in the same article. Yay! May you have a reason for a happy dance. I subscribe to the Daily OM. 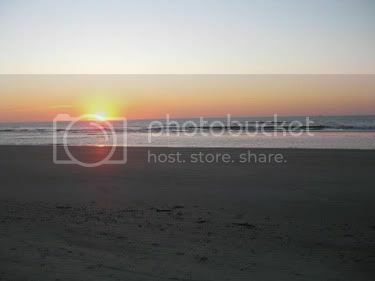 This one had an article about restarting in the middle of the day as if it were dawn and recommended a nice dawn photo. Now I have some very red/orange dawns...but for a dawn's promise of a new day, I thought I'd use this one. May you keep the freshness of dawn within you. All right I must admit the office is USUALLY a shambles, but now it's worse with stacks of books on the floor, most of the bookshelves of the 6 bookcases and 2 credenzas unorganized messes...and I am trying to reduce the "sagging" of shelves. So far all my published books (and the two unpublished that might someday make it to kindle, maybe within the year) have expandable envelopes...though now that I look at it, Heart Quest's isn't looking in good shape. 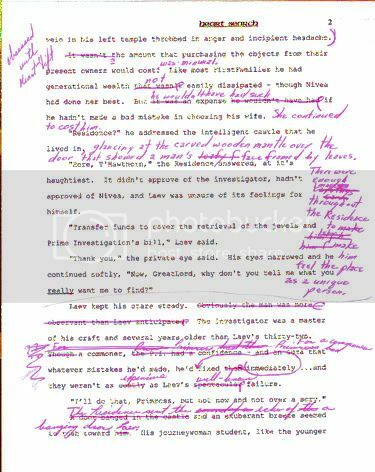 For some of the books I kept the copy edits and page proofs. For some I didn't. I have a few rejection letters, notably the one that crushed me for HeartMate...by an editor I met at RWA the next year when I was wearing my "RITA(r) Finalist" ribbons for best first book and best paranormal. When I finished my first ms. a work friend had it bound. So I have the first draft of my first full manuscript, The Token. Which is impossible to save. I include the first few paragraphs here. As you can see, I started with a dream, which is usually considered a no-no. May you enjoy looking back at the past...and more toward the future. I've been being a hermit (and re-reading Jayne Castle's books), this week. But tonight is the Rocky Mtn Fiction Writers Writer of the Year Panel at Tattered Cover Lo Do, 7:30. Usually we/they talk about publishing. Next week will be the RMFW Conference, and door prizes for tonight usually include a conference fee, WILL include some one-on-one breakfast appointments with agents and editors coming to the conference, free books, perhaps a critique of your work from Writer of the Year PAM NOWAK, a critique buddy of mine. My mentor Cassie Miles (pseud) will also be on the panel. Next week I'll be giving my seminar "Survive to Write, Write to Survive How to Hang In There Until You're Published," on Friday at the conference, be on that mini-plotting panel on Saturday a.m., and just generally hang at the conference.